Home News DBU Student Spends Summer In Washington, D.C.
DBU Student Spends Summer In Washington, D.C.
Sean pictured outside the Capitol after spending the day touring the building and meeting with individuals on the Hill. 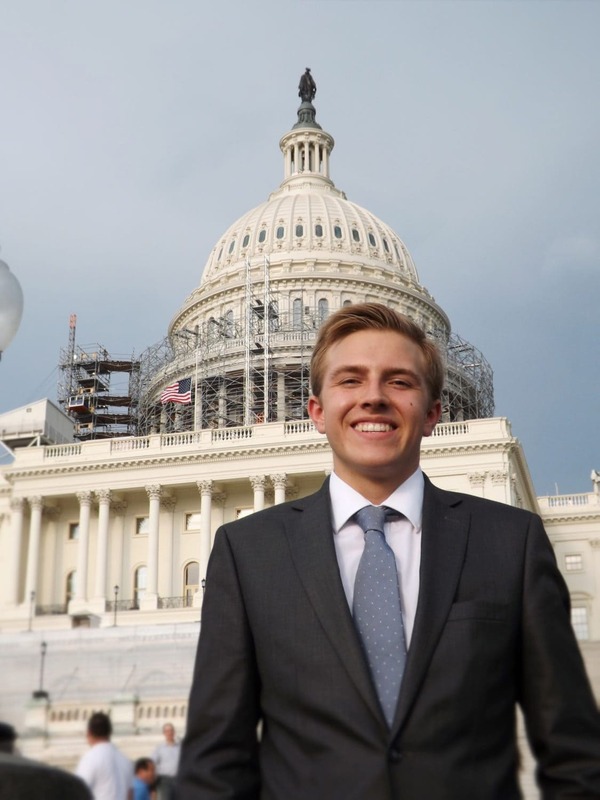 DALLAS—“I knew that I was called to be a part of something that is helping the persecuted this summer,” recalls Sean McAndrews, a junior studying political science at Dallas Baptist University. It did not take Sean long to realize he was being offered an opportunity to spend the summer in Washington, D.C. This would be an internship with the 21st Century Wilberforce Initiative. Founded in 2014, the 21st Century Wilberforce Initiative (21CWI) seeks to bring awareness to issues of religious persecution. It works with governments, advocacy groups, and religious organizations around the world in order to achieve religious freedom for persecuted individuals. Sean’s passion for the persecuted began prior to his experience with the 21CWI. In the summer of 2015, he had the opportunity to work locally with Refugee Services of Texas as an intern. “I served as a resettlement intern, which meant I assisted one of the case managers and primarily worked with Syrian and Iraqi refugee families who were resettling in the Dallas area,” McAndrews explained. In this position, he was able to not only help families with things like paperwork and job applications, but also served them by preparing their apartment before they arrived, taking them to medical appointments, and being there to aid them in any way possible. Sean credits this experience as what sparked a passion in him for refugees, ministering to Muslims, and fighting for the religiously persecuted. Many other students were packing for vacations or to head home at the end of the school year. Sean, however, was packing his bags to catch a flight to Washington. During his time in Washington, Sean was able to experience the work that the 21CWI does and got to be a part of such work himself. Sean also had the chance to help with the development of the Wilberforce Alliance campus chapters that bring the Wilberforce Initiative to college campuses. Their goal is getting young people involved in the fight against religious persecution. Sean plans to be a part of the chapter that will be starting this year at DBU. Looking back on his summer, Sean can see how his calling to work in the areas of international affairs and fighting for justice and human rights was strengthened. “This experience showed me how essential it is as Christians to fight for the freedoms of not only other Christ-followers, but also for all people of all faiths,” Sean reflected.